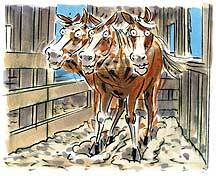 If your horse resorts to stall weaving and stall walking, you are naturally worried. This behavior is annoying and you are right to be concerned. Of course, from the horse’s perspective, you will need to understand that it is being forced to endure standing patiently in small spaces without moving, which is not natural to it. Experts believe that weaving and walking are but two sides of the same coin and thus are really parallel behaviors. It has been found that the activity of weaving gets more pronounced when a horse does not have other horses in its line of sight. Most often onlookers will be able to see a horse weave in front of the stall’s bars, perhaps it provides them with the visual stimulus they crave. Incidentally, straw bedding decreases the incidents of weaving, whereas wood chips seem to worsen them. If your horse tends to walk in its stall, it may fall into one of two categories: either it walks around quickly in a way that might remind you of a caged tiger, or it strolls slowly back and forth. Experts believe that these kinds of motion tend to calm down the animals. To help your horse not to fall into the category of excessive stall walking, you will want to make sure that the horse does not feel any more confined than is absolutely necessary, and the addition of a window to the stall will help the animal feel freer than just a blank wall. Lessening any feeling of isolation – whether it is from people or horses – is the goal of this exercise. Another way to help your animal is t provide a mirror. The reflection may make it believe that there is another animal in close proximity and incidents of stall walking are actually reduced. Of course, variety in food – such as added grass, hay and alfalfa or carrots – will greatly improve the animal’s disposition as well. Whatever it takes to keep boredom at bay is useful for implementing. Some experts actually notice that feeding time is the most sensitive when it comes to displaying symptoms of stall walking, and thus these animals should be fed first rather than be made to wait, since this will only increase the animal’s frustration. Exercise – especially if it can be combined with other horses – is a key element to helping the animal get well again. While there is medication available to treat this disorder, there is no guarantee, and additionally the course of treatment is expensive. Try the other avenues of behavior modification first. Read the next horse health tips article on Bump and Minor Hematomas.